Bells has serviced the skylines of Queensland, NSW and Papua New Guinea for over a decade. Being the first rope access and height services provider in Queensland certified to 18001 OHSAS compatible with our ISO 9001(Quality) management system. blend quality performance, safety compliance and procedural conformance that delivers for our customers. Not only are Bells technicians Industrial Rope Access Trade Association (IRATA) certified , but we are also one of only two IRATA certified and audited companies in Queensland. 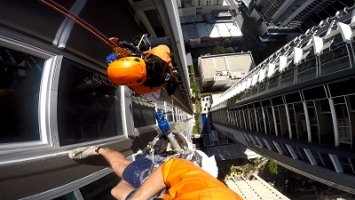 IRATA companies are certified to the highest technical, quality and safety standards which is in alignment with Bells drive to push the standards of Queensland Rope Access and Height Safety Industry to new levels. Certified to the international standards of OHSAS 18001, ISO 9001 and an accredited IRATA Company means peace of mind knowing your projects are undertaken safely, on time with quality results. Our capabilities allow us to deliver competitive pricing ensuring you’re getting the best value service. Bells Zero Harm philosophy, safety systems and proven procedures reduce risk which in turn means value for the client.